Buzz Aldrin, the second person to walk on the moon, has finalized his divorce from his wife, Lois Driggs Cannon, according to news reports. Citing "irreconcilable differences," Aldrin had filed for divorce in June 2011 after 23 years of marriage. Celebrity news website TMZ reported that the divorce order was signed in late last month and that Cannon, the third wife of the 82-year-old Apollo astronaut, is walking away with about half of Aldrin's fortune. 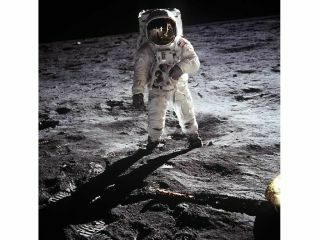 Aldrin, a native of Montclair, N.J., is a retired colonel in the U.S. Air Force and was educated at the U.S. Military Academy at West Point. He was selected as an astronaut by NASA in 1963 and accompanied Neil Armstrong on the Apollo 11 mission that touched down on the lunar surface for the first time July 20, 1969. In 1971, Aldrin resigned from NASA, having logged 289 hours and 53 minutes of time in space. The moonwalker gained new fame a few years ago as a contestant on ABC's "Dancing with the Stars" reality television competition.